Your favorite family memories are yet to happen! 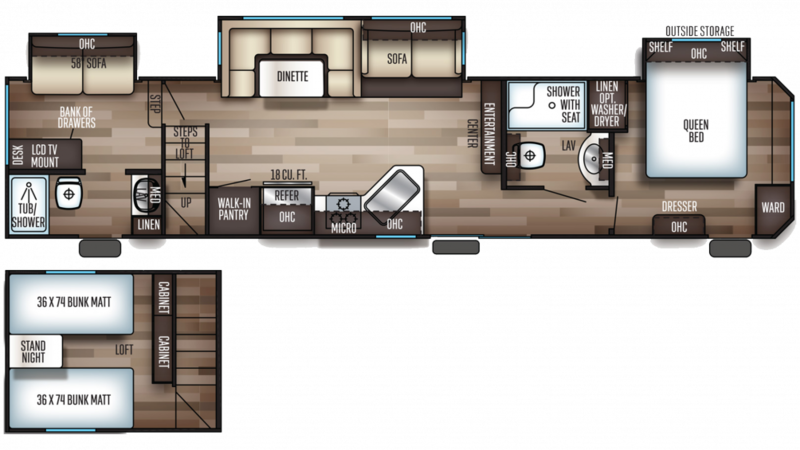 Go explore this great continent with the 2020 Forest River Cherokee 39CA! It's an amazing Park Trailer, built for long distance road trips with the family! You can find this model and others from the top RV brands in the nation at Lakeshore RV Center, the #1 RV dealer in Michigan! With our factory-direct prices and exceptional customer service, we've become one of the most popular dealerships in the nation! Even if you don't live near Muskegon, we can utilize our 24/7 nationwide delivery service to bring your dream RV to you! So stop by our location at 4500 E Apple Ave Muskegon Michigan 49442, or give us a call at 231-788-2040 to talk to one of our Cherokee experts today! Bring along friends and family because you've got room in this Park Trailer with its bunkhouse that has Loft for sleeping in comfort and privacy! A full day of RV fun means a family ready for a great night's sleep! There's ample sleeping space for the family, especially with the awesome loft space! The young ones will snuggle in and drift off to secure and sound sleep in real comfort.